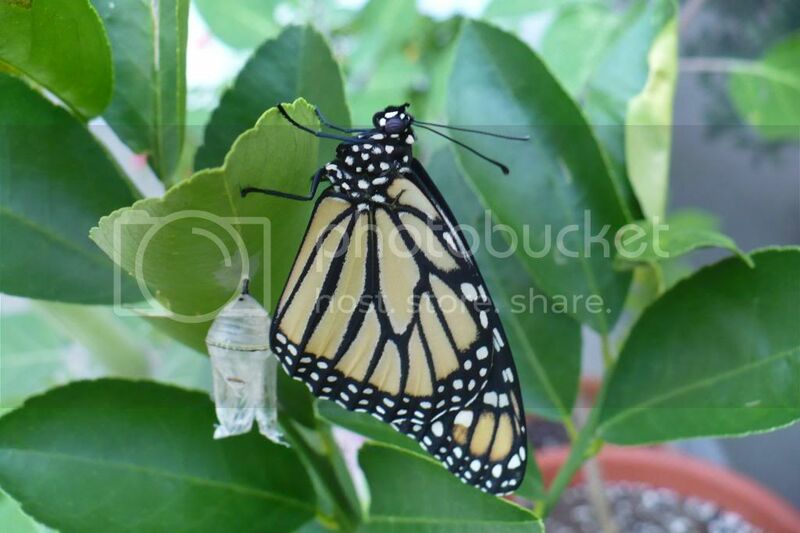 What is the difference between a Monarch butterfly and a caterpillar, and what is a chrysalis? Thank you! Caterpiller = larval stage of the butterfly lifecycle. 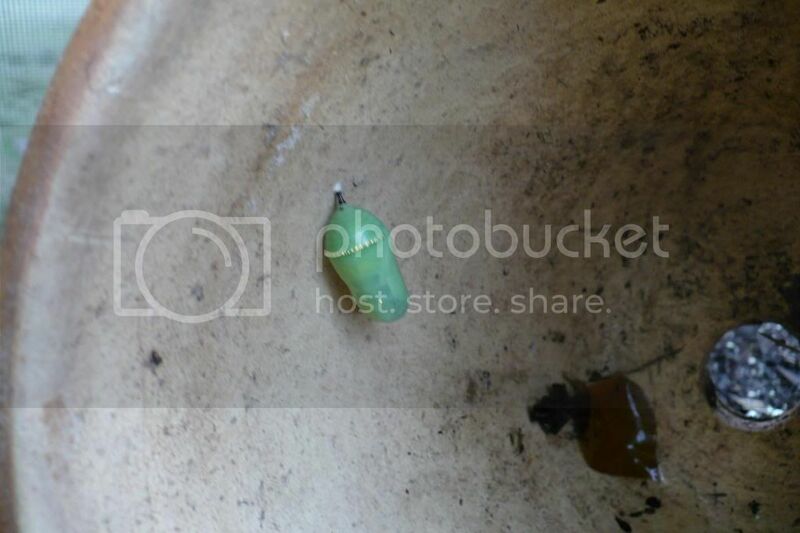 Vaguely worm like - a yellow green stripe I think, eats a lot of leaves and stores energy..
Crysalis hard coccoon that caterpiller spins/creates - in it the cattepiller metamorphizes into the adult form -- the butterfly. 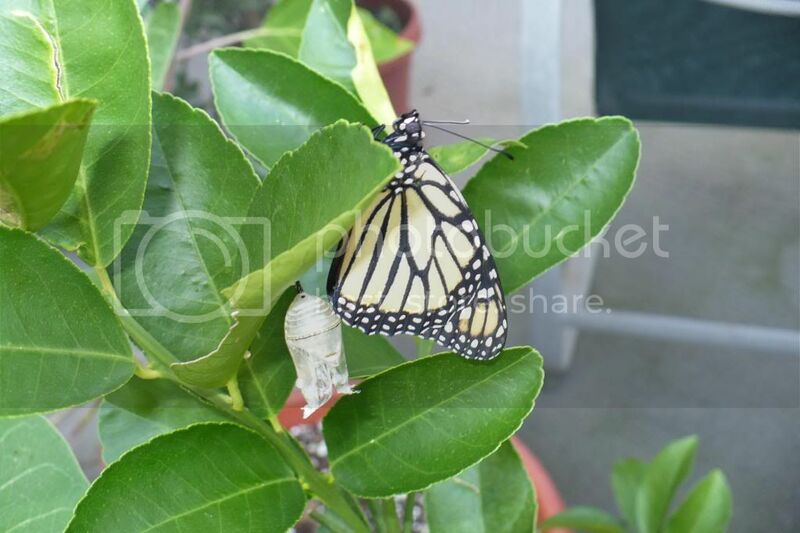 After the period of transformation - the butterfly breaks open the chrysalis, streches and dries its wings, and flies off - a Monarch (orange and black) butterfly. P.S. please forgive the spelling errors in this, for some reason my brain can't spell anything today and I am too lazy to spell check! 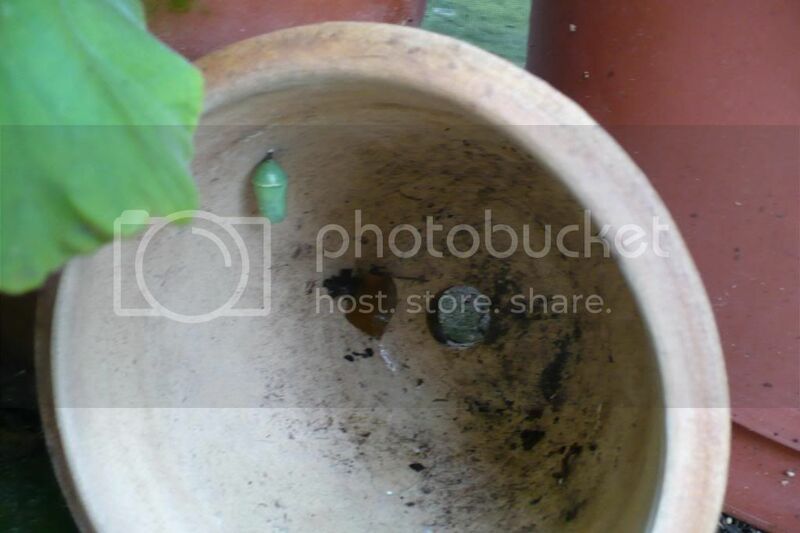 Here is a swallowtail chrysalis. I now have counted four of them in my parsley plant, and all of the hungry caterpillars are gone. I've got some of those on my moonflowers. I thought slugs were the problem. I took some pics of a butterfly today. It was yellow though, and i dont think it was a Swallow Tail. I'll have to edit it. To me that does look a lot like a swallowtail, except I don't see the swallowtail part at the ends of his wings. I am confused because almost all of the chrysalises on my parsley have hatched and the butterflies, while very pretty, do not look at all like swallowtails. Maybe there are more varieties than I thought? I'll try to post a photo tomorrow. I just posted on a butterfly forum... i'll get an answer and post back here. Eastern Tiger Swallowtail is what i was told.